One of the INDEX: Award 2011 displays now on show on the plaza outside the University of Huddersfield’s Creative Arts Building. This one contains lecturer Dr David Swann’s design for an all-new nursing bag. A GLOBALLY-renowned travelling exhibition featuring ultra-innovative designs that impressed judges in one of the world’s most prestigious competitions has come to the University of Huddersfield. We are the first university in the world and the first venue in the UK to host the event. And one of the exhibits is a potentially life-saving invention by one of our lecturers Dr David Swann. Established in the year 2000, INDEX: Design to Improve Life® is a Danish non-profit making organisation with a global reach. Its goal is to inspire, educate and engage people so that they use design skills to develop sustainable solutions to global and local challenges. Every two years the organisation offers the most valuable and prestigious design awards in the world, with prizes of €100,000 each for the winners of its five categories – Body, Home, Work, Play and Community. Dr David Swann earned his nomination for INDEX: Award 2011 by creating a nursing bag for the 21st century after discovering the iconic design that has prevailed for around 150 years could endanger patients’ lives. His radical update is made of non-permeable white plastic and is free from the pockets and folds that previously allowed harmful bacteria to accumulate. 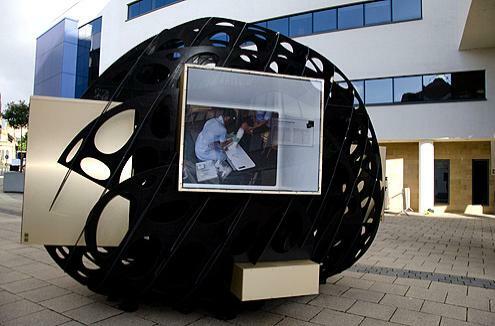 Other exhibits at Huddersfield include the Swedish-designed Hövding, described as the world’s first airbag for cyclists, which claimed first prize in the “play” category. The airbag explodes from a custom-made collar whose inbuilt sensors constantly monitor movement for the telltale signs that an accident is about to happen. Huddersfield is the first British institution ever to host the INDEX: Award exhibition and the sole UK stop on the current tour. via Events calendar – University of Huddersfield. Great review of Designing Women: Post War British Textiles, at the Fashion and Textile Museum, London by Artsthread. read on at Designing Women Post War British Textiles FTM London. The latest issue of Digital Arts magazine (January 2012) features the article ‘SET UP A LIVE ART EVENT’ written by Lisa Hassell (Inky Goodness) featuring Dave Bain & Andy Council and Huddersfield BA(Hons) Communication Design (Illustration) student and Crim Collective project developer Josh Bottomley. 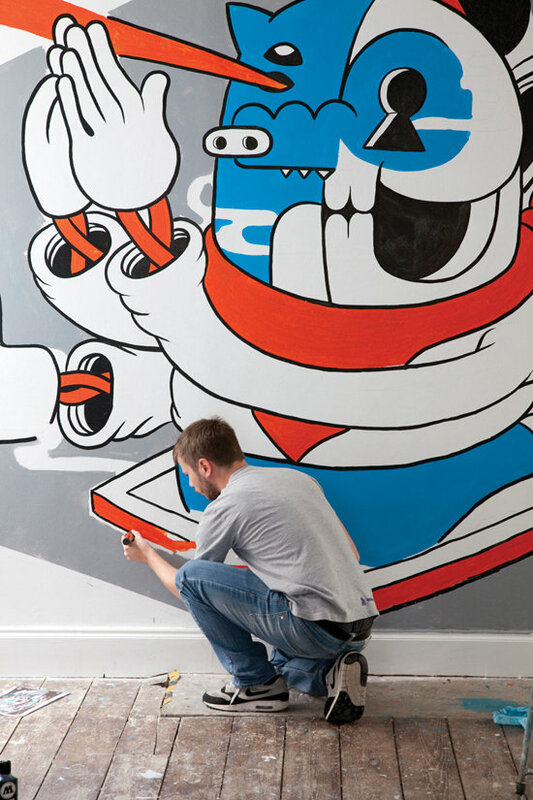 The piece comments on the burgeoning live art scene – how you can set up a successful night,how do you ensure the production of good art and keep the crowds entertained? “The V&A and Crafts Council celebrate the role of making in our lives by presenting an eclectic selection of over 100 exquisitely crafted objects, ranging from a life-size crochet bear to a ceramic eye patch, a fine metal flute to dry stone walling. Power of Making is a cabinet of curiosities showing works by both amateurs and leading makers from around the world to present a snapshot of making in our time. The exhibition showcases works made using a diverse range of skills and explores how materials can be used in imaginative and spectacular ways, whether for medical innovation, entertainment, social networking or artistic endeavour. Making is the most powerful way that we solve problems, express ideas and shape our world. What and how we make defines who we are, and communicates who we want to be. For many people, making is critical for survival. For others, it is a chosen vocation: a way of thinking, inventing and innovating. And for some it is simply a delight to be able to shape a material and say ‘I made that’. The power of making is that it fulfills each of these human needs and desires. Via About the exhibition – Victoria and Albert Museum. Trend forecasting and design guru, Lidewij Edelkoort, will be promoting young textile design talent from the UK and Europe at her Talking Textiles exhibition at the Salone Satellite 2011 Milan Furniture Fair which will be celebrating its 50th anniversary and will be expecting around 300,000 visitors from 12th to 17th April. A selection of young graduate designers will be showcased as part of Edelkoort’s ongoing initiative to promote textile design education, bringing the freshest European design talent to public attention. Supporting the graduate designers exhibiting and Li’s quest to save the endangered discipline of textile design are Skillset, British Fashion Council, UKFT and Texprint. Terry Sutton is one of Yorkshire’s most gifted illustrators, and in Hard Graft he has used his talents – both as an artist and as a photographer – to pay tribute to Yorkshire’s rich heritage of craftsmanship and industrial achievement – its willingness to roll up its sleeves and set to work. As well as over 75 of his own watercolours, Terry has included a carefully chosen selection of engravings and historic photographs to celebrate Yorkshire’s industrial past and it appetite for hard graft. Available from mid-October. There’ll be an exhibition at the Piece Hall Halifax next April. Discover some of the past industries of Yorkshire through the fantastic illustrations and photographs of Terry Sutton. Following Terry’s successful exhibition, Yesterday’s Yorkshire, A Celebration of the Industrial West Riding by Terry Sutton in 2004, Terry once again uses his wonderful illustrations and photographs to captivate audiences young and old. An exhibition by artists who depict urban scenes. Please book immediately as the talk will be canceled later this evening if there are no further bookings.